Joaquim Cusí was a friend of Salvador Dalís father and he became an enthusiastic supporter of the young artist. Mr. Cusí was a successful pharmacist with no training in art, and yet he was the first one to purchase numerous paintings and drawings from Dalís earliest exhibitions. The works acquired by Mr. Cusí were not seen again on display during his lifetime, and scholars were never allowed to see the full extent of the collection until it was donated to the Museu de Montserrat in 2005. 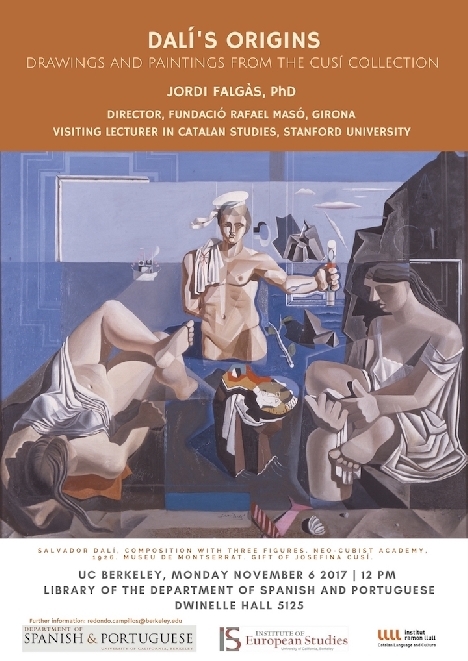 Jordi Falgàs has been the first art historian to study and publish these works, a significant chapter in Dalís early years. In this lecture he will present the results of his research, which constitute the basis of his forthcoming book.